Beginning on Monday, March 11, 2019, the right lane of Route 8 Southbound and the Exit 19 off ramp from I-84 Eastbound to Route 8 Southbound will be closed to allow for bridge deck rehabilitation work on Route 8 Southbound. Please note that the Exit 19 off ramp to Sunnyside Avenue will remain open and used as part of the detour route. Daily temporary lane closures will extend for approximately seven (7) months during off peak hours (days/nights). Motorists are advised to follow posted detour routes. Beginning on Monday, January 28, 2019, Exit 19 and Exit 20 off-ramps from I-84 Westbound and the Bank Street on-ramp will be closed to allow for the installation of the temporary pavement markings and temporary sign panels for both exits, removal of existing overhead sign panels and the installation of temporary work platforms needed to complete concrete deck and structural steel repairs. Daily temporary lane closures will extend for approximately six (6) months during off-peak hours (nights). Motorists are advised to follow posted detour routes. TO VIEW REAL TIME TRAFFIC CONDITIONS, CLICK THE MAP BELOW. Below, our project team is installing the bridge superstructure (deck) for Temporary Bridge No. 1 over the Naugatuck River. Temporary Bridge No. 1 is one of three temporary bridges being constructed as part of the Route 8 northbound temporary bypass. Beginning on Tuesday October 16, 2018, the on-ramp from Riverside Street to Route 8 Southbound will be closed starting at 7:00 p.m. and will re-open the following morning at 6:00 a.m. To access Route 8 Southbound, motorists should continue south on Riverside Street (Riverside Street turns into Charles Street) to the next on-ramp. This closure will be in effect nightly for two (2) to three (3) weeks. Beginning on Sunday October 7, 2018, one lane on Route 8 Northbound from Exit 30 to Exit 32 will be closed starting at 7:00 p.m. and will re-open the following morning at 6:00 a.m. These closures will occur Sunday through Friday and will be in effect for three (3) to four (4) weeks. Southbound Riverside Street has been changed to bi-directional (two-way) traffic. Northbound Riverside Street is now closed. Motorists are advised to follow signs and revised traffic signals. Exit 30 on-ramp is closed and traffic is detoured to Bank Street and Riverside Street. 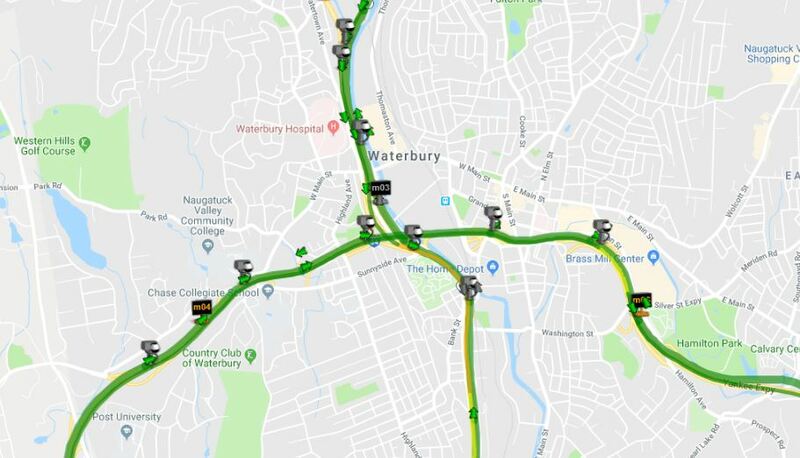 Motorists are able to access I-84 eastbound from Meadow Street and Route 8 northbound and I-84 westbound via Riverside Street. Signage is posted to guide motorists through the detoured route. Exit 32 off-ramp to northbound Riverside Street is closed and traffic is detoured at Exit 30 off-ramp. Motorists will be guided northerly along South Leonard Street before it becomes northbound Riverside Street. Signage is posted to guide motorists through the detoured route. If you have questions and would like to reach us immediately, please feel free to contact our field office at 203-639-2394.